After a very long day of travel we arrived at our accomodations—a room in an apartment that had been converted to a miniature B&B. We opened up our window and realized that the dome we could see in the distance belonged to St. Peter’s Basilica. It appeared to float above the Vatican walls, lit up brightly against the darkening twilight. 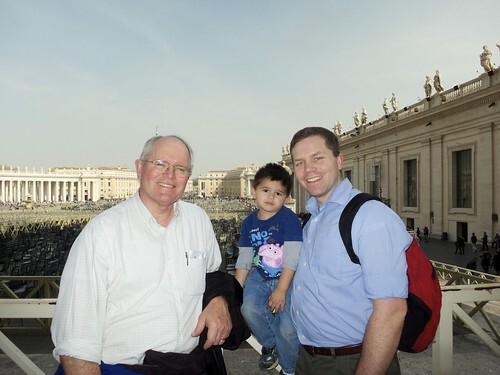 After a long car ride, a flight, a bus ride into the center of Rome, and a metro ride towards Vatican City, all punctuated by tiring walks laden down by our luggage, we were happy to find that we had picked out a good place to stay, with friendly hosts and a great view. To top it off, our hosts recommended a nearby restaurant that was truly excellent. 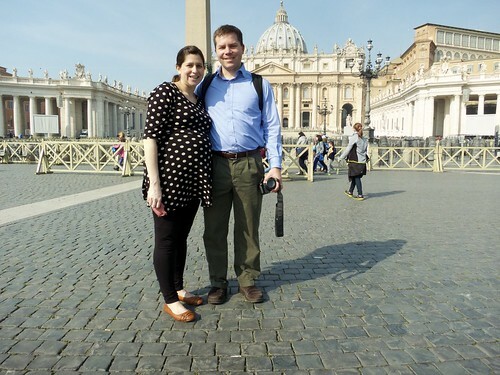 This was the first of two international trips we took during the third trimester of Jenny’s pregnancy. 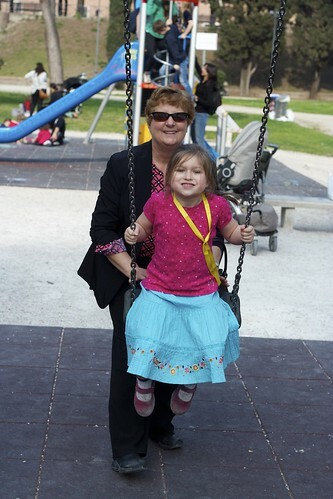 She was worried about whether she would be able to enjoy it, but we had a good reason for going when we did. 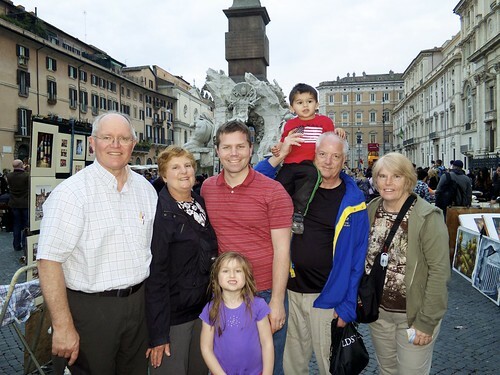 My father, the Director of Bands at Towson University, had planned a tour of Italy for the Symphonic Band during their spring break. My mother and my uncle and aunt were also going on the trip, and we wanted to see them while they were on the same side of the Atlantic ocean. 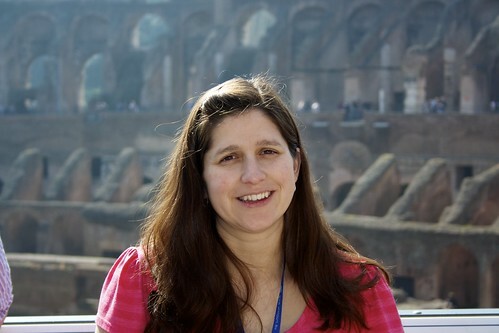 Besides, Jenny is always happy to have an excuse to visit Italy. It was a short trip for us, with just two full days in the country, but we tried to make the most of it. On the first morning we walked down towards the main entrance of Vatican City before returning to the entrance of the Museums for our scheduled time slot. The tourist trade in the area was something to behold; there aren’t many places in the world that have enough foot traffic to attract immigrant vendors selling knockoff purses, sunglasses, street art, and all the other popular trinkets of the day. In addition, there were lots of microentrepreneuers working the long lines waiting for entrance to the museums, offering upgrades and immediate entry. We mostly ignored them, but I decided to have a little fun with a particularly aggressive one: I addressed him in Russian and said I didn’t speak any English, but he was ready for me! On the reverse side of his clipboard was a Russian language listing of his offers and prices, and he even spoke a little bit of the language. I hope it was enough for him to understand when I said we already had tickets. The Vatican Museums are pretty amazing in their own right, but they aren’t really the main attraction. We tried to appreciate some of the works of art and history as we made our way toward the Sistine Chapel. 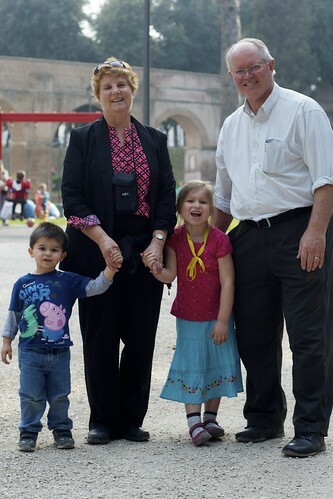 Elena and I enjoyed looking at the tapestries and deciphering the scripture stories that they depicted. It was pretty confusing when we saw some that had images from Greek mythology instead of the Bible. According to Find my Friends, we were in the museums at the almost the same time as my family and the band, we never quite found them. We eventually made our way into the crowded Sistine chapel and looked up at the iconic frescoes. Elena and Roman were both reasonably polite and quiet, even though they were getting tired and Elena wanted to continue learning about the subjects of the painting. I paused for a moment to think, as I tend to do in such situations, about how odd it is that our children have already been so many places and seen so many things, and wonder what they’ll remember about their childhoods when they grow up. After the Sistine Chapel there are several more halls of historical artifacts, but we hurried through them in search of a bathroom and snacks; we all needed a break. We weren’t sure when we would meet my parents, so after the museum we took comfort in lunch at Burger King. I eventually got in touch, and we arranged to meet near the Piazza San Pietro. Elena and Roman were so excited to see them! We toured the Basilica, then made the short walk to the Castel Sant’Angelo, also known as the Mausoleum of the emporer Hadrian, famous in our part of the world for the wall that defined the northern border of his empire. We didn’t know much about the history of the castle, we just knew that it had park area in what used to be the moat, where we were lucky to find a playground. 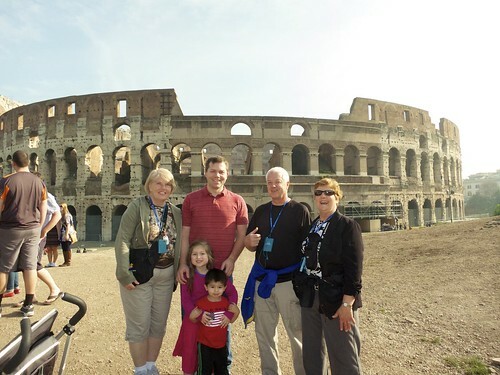 Eventually, my parents had to head back to meet up with their group, but we made plans to meet the next morning at the Colosseum. I had promised Jenny that we wouldn’t have to walk all the way back to our hotel, and I thought I could fulfill that promise by taking us to the nearest metro stop. Unfortunately, my distance estimate was completely off—as it turns out, our hotel was closer than the metro stop even if we had taken the most direct route, which we didn’t. No matter how hard I try to avoid it, every trip we take it seems like I manage to force us to take at least one long walk when we’re all very tired. 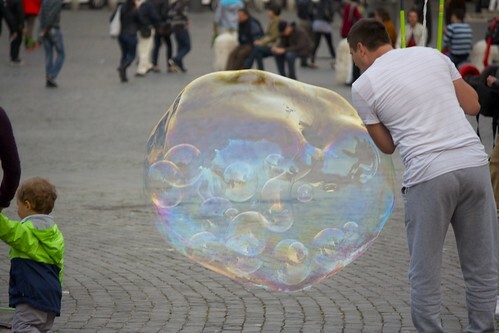 And yet this trek, like previous ones, did have some redeeming qualities: we followed the river for a little while and watched a sculler pass by, I was very distracted when we stumbled upon the amazing open air art museum of Fausto Delle Chiaie, and we took a break to watch the street performers and giant bubble artists in the beautiful Piazza del Popolo. 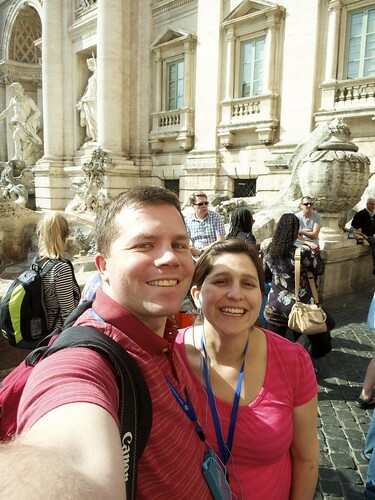 On the following day, we got to join the band for a tour of many of the main sights of ancient and modern Rome. Their tour operator had arranged for Paolo, a trained tour guide and art historian by education, to be their guide, and we got to tag along for the whole day. We thought we might just go along for the morning, but it was so engaging and Jenny had enough energy that we stayed with them for the whole day. 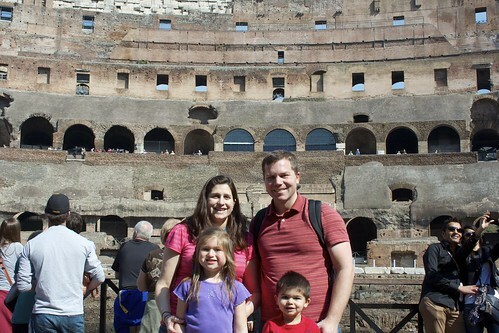 The tour started in the Colosseum, where Elena and Roman found lots of places to climb and jump, and found out how fun Great Uncle Mark could be, then proceeded through the forum. We paused for a while to talk about the responsibilities of the Vestal Virgins, which brought up some long forgotten memories from my high school Latin class. 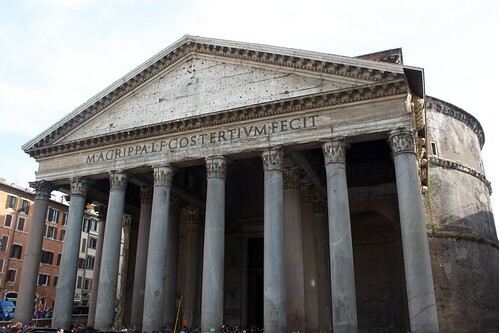 After ascending out of the forum via a long, steep stairway, we were happy to find out that we would be allowed to join the group on the bus ride over to the Trevi Fountain, where we would take a lunch break and then resume the tour in the afternoon. In the afternoon, after throwing coins into Trevi Fountain to ensure that we would someday return to Rome, we did our best to see the rest of the sights, just in case we didn’t. We walked by the Spanish Steps, the Piazza Colonna and the Prime Minister’s residence, then on to the Pantheon and then the last destination of the day, the Piazza Navona, where we marveled at the fountains and perused the art market. After a long wait, we took Elena to a souvenir shop where she was allowed to spend some of her own money. We let her choose for herself, and even though we advised her to pick something that would remind her of this trip and this place, she bought a couple of shiny little bracelets. Evening was already setting in, so we spent another pleasant hour with my parents, wandering through the alleys and back streets in the area, eventually finding a store where my father bought some Italian candy to take to people back home. And then we had to say goodbye, with the promise that we would see them again soon. That evening, we had an amazing pasta dinner at a tiny little restaurant. 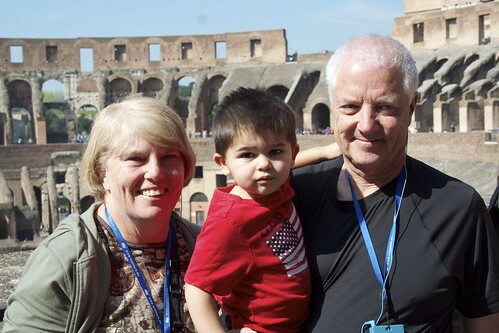 The next day, we endured another long travel day as we returned home, full of memories of Rome and Grandma and Grandpa.